The grinding disc FAPI-ATTACK is ideally suited for extremely aggressive grinding work and is primarily used for aggressive grinding both on the surface and on the edge. High performance in manufacturing. With a wide range of grinding materials for the surface and a precisely calculated angle position of the abrasive cloth flaps highest possible grinding output can be achieved with good surface quality at the same time. The service life of the grinding disc FAPI-ATTACK is many times longer than the service life for a standard grinding flap discs. In addition, the abrasive cloth surface can be worn to its base. This saves replacement times and contributes significantly to operating 3 cost savings. 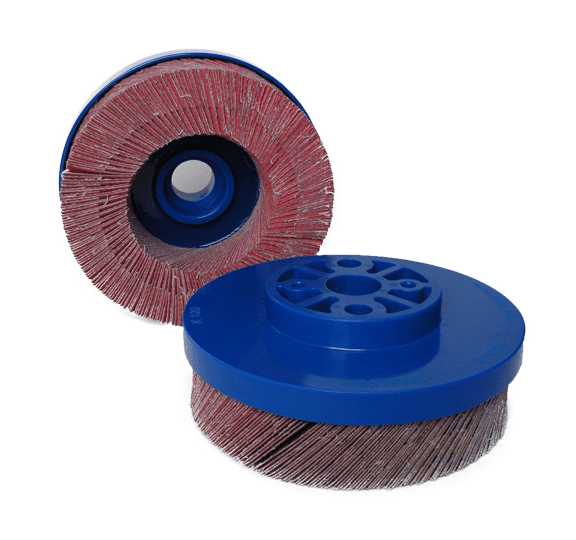 Despite the enormous aggressiveness of the grinding disc FAPI-ATTACK, various surface qualities can be achieved with the selection of the right abrasive cloth. A compromise must be found between grinding output and surface qualitz. The dimensions of the grinding disc FAPI-ATTACK and holder can be tailored individually to processes in your operation. Diameter, facing height, angle position, etc. can be made as desired.